Health experts are warning about the dangers of undercooked or raw eggs after a salmonella outbreak in the United States. Experts have some simple advice when it comes to eating runny eggs these days: Run away. Food safety experts warn eggs should be cooked thoroughly in order to avoid the risk of salmonella. ((Spencer Green/Associated Press))With salmonella poisoning concerns triggering the recall of more than a half-billion eggs in the U.S., warnings are becoming more dire every day against eating undercooked yolks and translucent egg whites. Don't eat any questionable eggs — cooked or otherwise — if they are cracked or have been sitting in the refrigerator too long. Eggs remain fresh in the fridge for about a month after purchase. Fried or scrambled eggs must be cooked to a temperature of 72 C (160 F). This means about two to three minutes per side for a fried egg, or until solid for scrambled. A digital instant thermometer is the best way of knowing when you've hit the proper temperature. For fried eggs, take a break from sunny-side up and try eggs over hard: fried on one side, then flipped and fried well on the other. Mopping up oozing yolks with toast? Bad idea. Consider making hard-boiled eggs, rather than soft, by gently simmering them for about 15 minutes. Hard-boiled eggs last about a week in the refrigerator. As for poached eggs, a little longer is a little better. Though most recipes suggest short cooking times in barely simmering water, for safety it's best to let the egg go for about five minutes at a gentle boil. Drinking raw eggs for a protein boost? That's an even worse idea, given the risk of salmonella and its violent nausea, vomiting, abdominal pain and temporary residency in the bathroom. 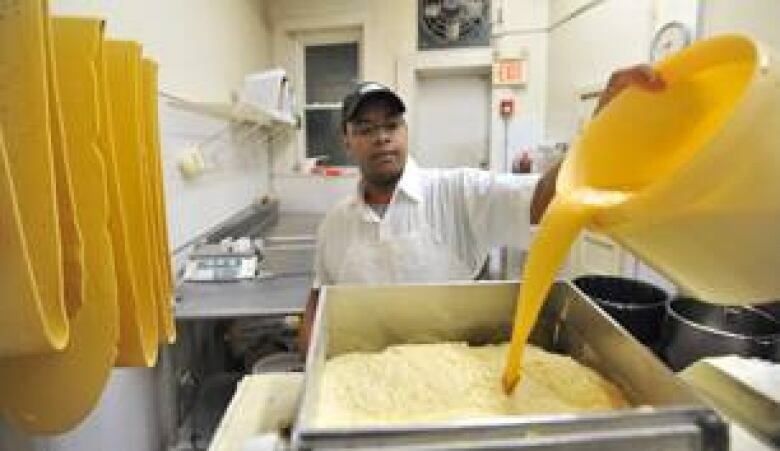 Edvaldo Pereira mixes pasteurized eggs into dough for egg pasta at Dave's Fresh Pasta in Somerville, Mass. ((Josh Reynolds/Associated Press))Last year, the camp cracked about 300 shell eggs every morning. This year, it switched (before the recall) to a pasteurized liquid egg product. As the name implies, pasteurized egg product — usually sold in cartons near milk in the store — has been gently heated to kill off pathogens, meaning it should be safe to consume even when not fully cooked. It's not a perfect substitute, but for most home cooks it should do the job just fine. 1,300 salmonella cases reported in U.S. The salmonella bacteria concerns, which centre on eggs from two Iowa farms, prompted a recall of about 550 million eggs in the United States. But San Francisco-based food scientist Harold McGee, author of the upcoming Keys to Good Cooking, isn't all that worried. Overall, he thinks the odds of getting sick favour the home cook. Egg salmonella outbreak expected to grow in U.S.